Art Workshop available in Alphington Victoria. I have a workshop available this Wednesday afternoon with only two other people as I try to cap it to only three. You can paint or make mixed media collage in a very relaxed no pressure environment. Let me know if interested. Date is 20th Feb 2-5pm. Experience or beginner are both ok.
Let me know if you are interested and we can discuss what materials you have or do not have. If it’s a one off class I’m sure I can supply for you. Favourite colour is all kinds of yellow. This is a small painting of around 25 x 25cm using acrylic on board. This is one of a series of four still-life works. They are all framed in blondewood box frames. I will post some of the others later. Loved making them and using super vibrant colours. I have used a limited palette as I always do however I will always introduce alizarin crimson for apples. So only four colours plus white. I think you can call that pretty limited. Peachy, orangy colours but it’s a persimmon. A small painting on board done using acrylics. The fruit is off my tree that refuses to grow taller. Many years ago I took a photo of myself in front of the newly planted tree hoping it would get taller but alas it is still the same size. I get only about six pieces of fruit from it. The best thing is it is a pretty tree and the fruit is delicious. From a tree we can build. First image is a little Character I made as a lucky charm or lucky protector. It’s made of wood, woodcarving, painting, found charms and some other quirky bits. I am making more of these before I decide if I like them enough to keep going. Currently I have a little man in a suit and tie with a mohawk (yet to paint). I do become connected to these little people as my wood carving is pretty limited and very very slow. Here is a detail from a collage/mixed media series I am making for an exhibition in Canberra in October. I have made several pieces that are merging people, industry, nature etc. Where things start and or finish might be ambiguous. Really really reduced prices Artist Sale at Cambridge Studio Gallery Collingwood. 1 weekend only! 52 Cambridge Street, Collingwood. See their website and pictures of works for sale on their instagram site. Rare opportunity to purchase artworks at radically reduced prices. Artists are cleaning out their studios, real gems available for one weekend only. Sale -This coming Weekend 17th and 18th February only. 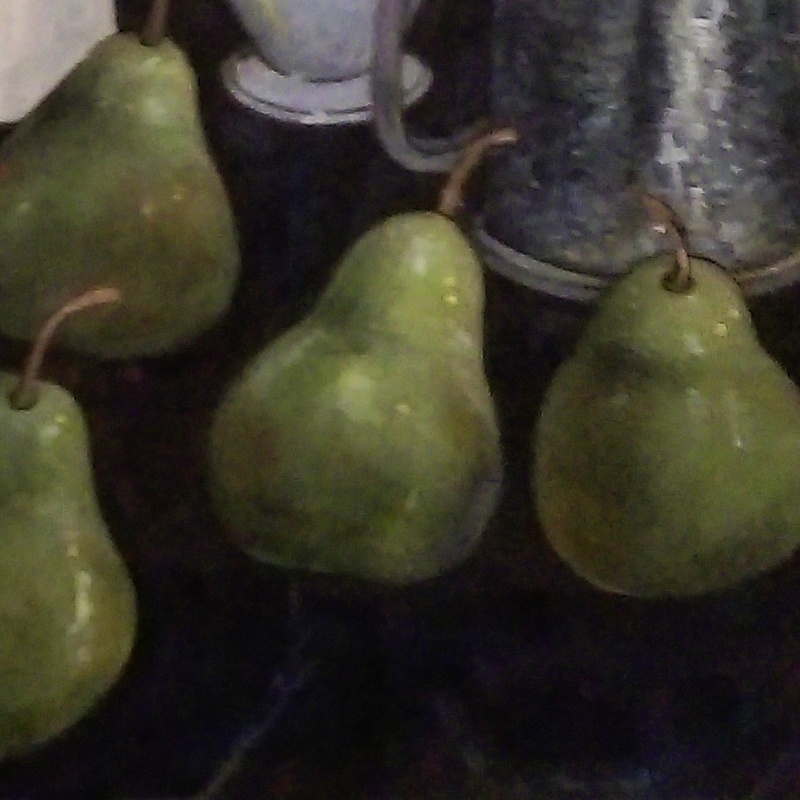 Workshops: I am looking for two people that would like to take Wednesday Still-life Workshops in Acrylic with me. As the classes are so small it would be easy for me to teach Collage/Mixed Media if you prefer. We meet here in my home studio in Alphington (Victoria, Australia) at 9.30am to 12.30pm.No experience necessary, I will show you my techniques which will make painting fun and easy, you can then adapt to suit your own style. You only need to love art to do these classes so don’t let your experience or lack of experience stop you from learning something new and sharing this experience with others. If you are interested or know of anyone else that may be interested pass on my information please. I would like to start this Wed 14th or the following one on 21st February. I’ll put it on my Website as well. www.annewarrenart.com. Wednesday Workshops in Art available. Art exhibition nearing at Alphington Open Studios at the end of the month. Just want you to know that the Alphington Open Studios will be on again on Saturday 25th and Sunday 26th of November. For more information go to the Facebook Site Alphington Open Studios or to the website http://www.alphingtonstudios.com. You will see information and images from all of the exhibiting artists. 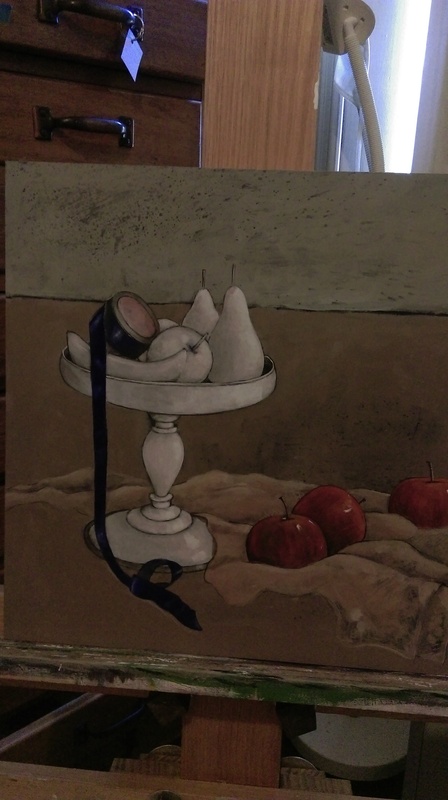 Below I have inserted a still life painted image and below that a mixed media drawing and painting. Hope you like them. Please note that I now have a new Website http://www.annewarrenart.com that I hope you will look up for more gallery pictures. Melbourne East Arts Festival art exhibition August 18-20th. I was so pleased to be invited to exhibit works at the Melbourne East Arts Festival on Friday 18th August to Sunday 20th August. Inside this beautiful little church, alongside the magnificent stained glass windows I will be exhibiting a solo still-life exhibition of paintings made especially for this occasion. In another room I will be exhibiting a selection of collage work with the highly regarded and beautiful sculpture of Michael Meszaros. By the way I have heard that the wine and food flows at this event. Hope you can come along and join us at the Friday evening opening at 8.30pm (note there is a $10 fee as it is a fundraiser for the church) and please also keep in mind the other calendar of events available during this weekend. Michael and I will be there most of the weekend to talk to you. Please contact me for any further information or contact the email addresses on the brochure. If you are blogging friend of follower I would love for you to pop in and say hi to me. If you wish to see more of the work I am exhibiting you can email me. Coming soon my art exhibition in East Melbourne. I will exhibit collage/mixed media work and still-life painting and Sculpture Michael Meszaros will exhibit his 3d sculpture on the August 19-20th. Here are a couple of details from my work. 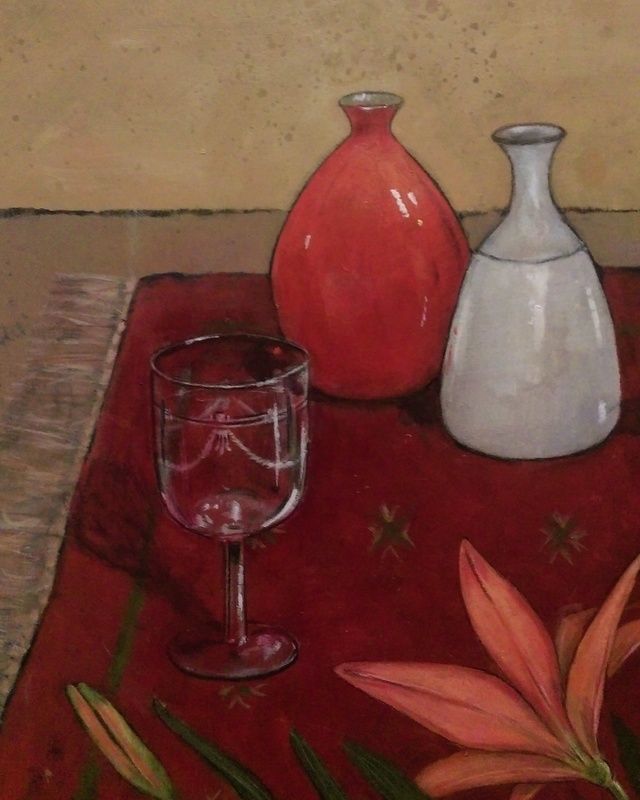 The still-life work is acrylic on birch board or canvas and the collage work is on paper. Hope you can lock in the date. 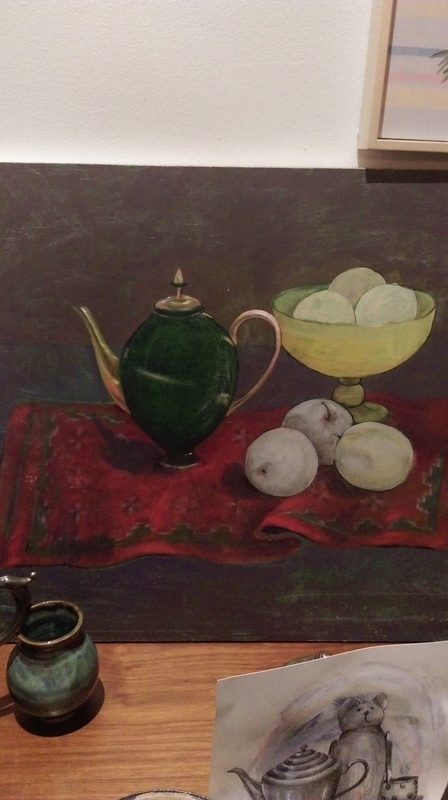 Still life paintings change of mind pictures. So many changes. Pears gone, Lily gone, ribbon gone, teapot gone. Hours and hours of work. It’s a good feeling to accept that something is not quite right. I removed the problem bits and looked at a different set up with fresh eyes. Ahh happy now. Μια προσπάθεια συγκέντρωσης και παρουσίασης της εικαστικής καλλιτεχνικής δημιουργίας στην πόλη της Θεσσαλονίκης. An attempt to assemble and present the visual artistic creation in the city of Thessaloniki, Greece.